This post is intended to help you find Base System Device Driver for your Windows 7-based PC regardless of your PC’s make and model. In this post, we will talk about four ways to find and install the correct Base System Device Driver for your Windows 7-based PC or laptop. Also, this post will help you understand this problem better. Finding the correct Windows 7 Base System Device Driver for your PC or laptop is a very common problem experienced by many PC users. Most of the time, this problem occurs after upgrading to Windows 7, or after a fresh-install of your Windows 7. Why is that so? Because during the Windows 7 installation process many device drivers will be deleted, including the drivers for Base System Devices. What Makes Finding Windows 7 Base System Device Driver Even Harder? Well, it’s because a Base System Device listed under Other Devices in Device Manager is not an actual device or component of your Windows 7-based PC or laptop. On the other hand, for example, when you have your Audio Device listed under the Other Devices section, you know that you need to install the drivers for either your audio card or speakers. 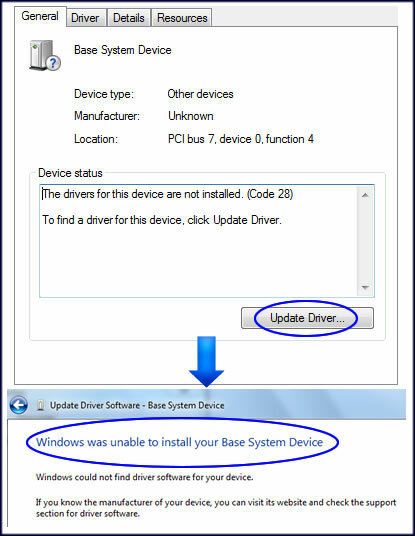 You probably already tried to install Base System Device driver by clicking the ‘Update Driver’ button in the Properties of the Base System Device (see the image below), and you received the message saying “Windows was unable to install your Base System Device.” Once again, the main problem here is that Base System Device is not a real device! Our research shows that, most of the time, Base System Device in Windows 7 turns out to be either 4-in-1 or 5-in-1 SD Card Reader Device or a Chipset Component. This is the easiest – saves your time and energy – and safest way to find and install the missing drivers for your Windows 7 Base System Device. In addition, this software will automatically update all missing and outdated drivers. Keep in mind that outdated drivers can have significant impact on your PC’s performance. If you have you driver backup CD you can try installing SD card reader driver. Most of the time, SD Card drivers are either Ricoh or JMicron card reader. This will only work if your backup CD contains Windows 7 compatible drivers not Vista or XP. If you’re going to undergo Windows 7 Base System Device Driver download (.exe or .zip) manually, then it is highly recommended to visit the official website of your PC provider. For example, if you have a Dell laptop, go to www.dell.com, if you have Hewlett Packard, then visit www.hp.com, etc. The official website of your computer manufacturer offers free driver downloads, and you can search their forums for helpful threads regarding your base system device driver issues. You will need to dedicate some of your time and energy to fix your Base System driver issues manually, and you still need to take note of the important details of your PC before proceeding to download device drivers. These details include the model of your PC (you must know this from the start), and your Windows 7 OS type (if it’s 32-bit or 64-bit OS.) You can view your OS type by clicking the Start button, type msinfo32.exe, click Enter, and look for the System Type. Knowing the system type is important in order to avoid incompatibility issues when installing device drivers for your computer. 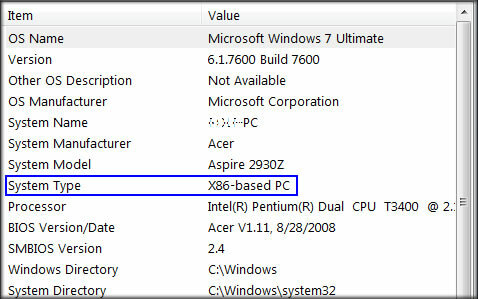 X86-based PC means that you have a 32-bit Windows 7 OS, while X64-based PC means that you have 64-bit OS. You must make sure that the Base System Device drivers that you’re going to download are compatible with your System Type. Take note that some older PCs or laptops don’t have Windows 7 driver updates. In this case, you will need to install a base system device driver in Windows 7 Compatible Mode. This method can be handy if you have a custom build PC or if you are not willing to pay $29.95 USD for an automatic driver update software license. 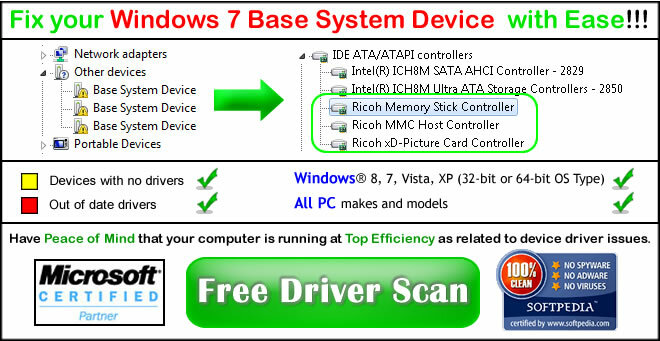 In summary, in order to find Base System Driver for Windows 7, you need to understand that the phrase “Base System Device” in Windows 7 is not a real identity of your problematic device, but it’s either an SD Card Reader or a chipset component of your PC.